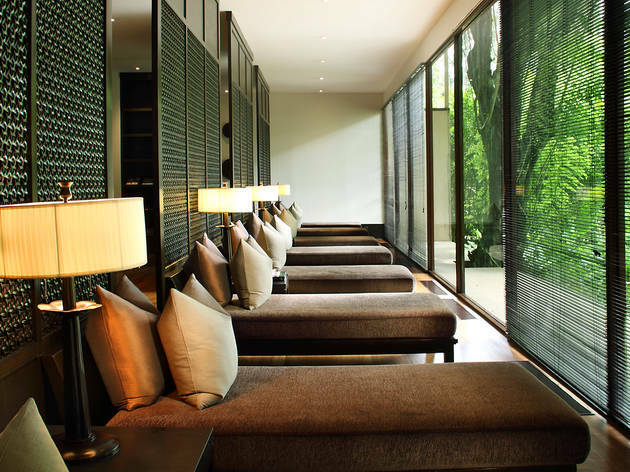 The Spa and Med Beauty at The Saujana is the kind of spa you'd want to come back to again and again. 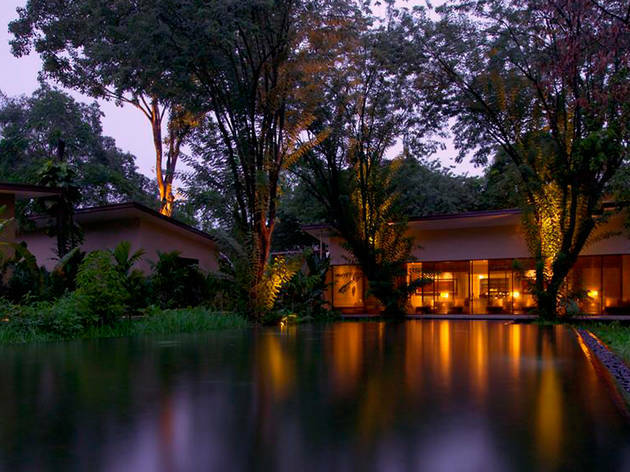 Its reclusive setting, which looks like a super luxe tropical rainforest resort with only eight spa villas, makes a spa outing here feels like a retreat. All decked out in dark tones and intricate lattice wood work, each luxurious villa comes with an oversized natural stone bath (big enough for two), a rain shower and steam room, and a three-layer massage bed that is the most comfortable I have ever laid on. 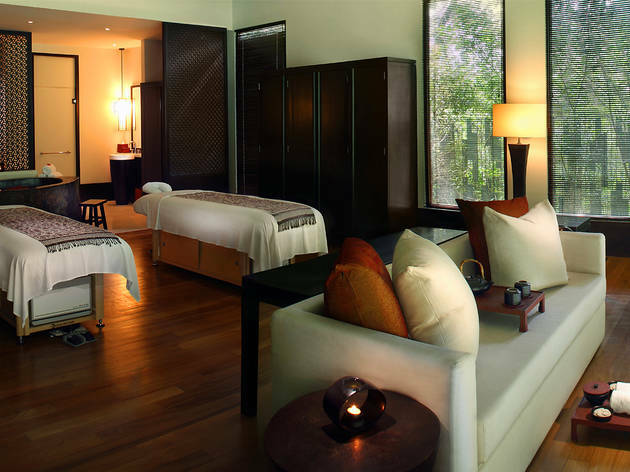 The treatment menu is peppered with Asian (Bali, India, Thai, Tibetan and the Himalaya) healing and therapeutic rituals ranging from facials to massages and body polish. There's also a separate Med Beauty treatment menu featuring non-invasive, state of the art plant stem cell based beauty therapies. 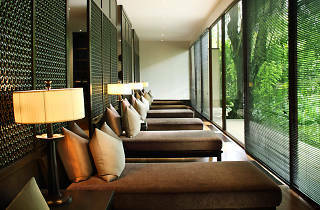 My 60-minute Saujana Jade Massage, the spa's signature treatment, is a four hand oil massage using the thumb, palm and elbows, with techniques borrowed from Shiatsu, Balinese, Thai and Lomi-Lomi massages. I must admit, having four hands working on your body at the same time can be a tad disconcerting at first. It's almost like a sensory short circuit as you don't know where to focus, but soon it gave way to one firm but very relaxing massage. The thing that impresses me the most about The Spa and Med Beauty is that you are encouraged to slow down and take your time. You can enjoy the facilities at the spa at your own pace. 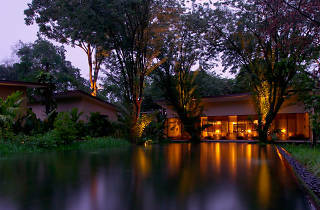 After the foot polish prior to my treatment and even after my massage, I was encouraged to stay and relax in the villa. (There was even a pot of ginger tea prepared for me as well.) This became the highlight of my visit as it gave me a private space for my personal time away from everything. In most spas, no matter how well designed the room is, you don't get to enjoy it much as you are politely ushered out of the room right after your treatment, which is a pity really. Once I was ready, I came out of my villa feeling like I'd had a long rest. But that wasn't the end. My therapist brought me to the relaxation lounge. There I could help myself to organic tea, water or the refreshing lemongrass citrus drink. My therapist even offered me some cookies as I laid on the day bed and stared out blankly into reflection pool and the surrounding lush greens. Those moments of doing absolutely nothing were just the antidote I needed.